Broccoli wasn't produced commercially in the U.S. until the 1920s, but since then it's become a dinner table mainstay. To maximize broccoli's already considerable nutritional punch, look for dark green bunches with firm stalks and florets with a purple or blue tint, which have higher vitamin contents than rubbery yellow bunches. Because manufacturers usually remove most of the stalk, which has a lower vitamin A content than the florets, frozen broccoli often has as much as 35 percent more beta-carotene than fresh broccoli, but the freezing process reduces other vitamin and mineral contents, according to the Centers for Disease Control and Prevention. Boiling broccoli reduces its vitamin content more than steaming, sautéing or microwaving it, but any way you eat it, broccoli is a rich source of essential vitamins. Broccoli contains beta-carotene, a provitamin A carotenoid that the body converts to retinol, a bioavailable form of vitamin A. The body converts beta-carotene into retinol more easily than it does other forms of vitamin A found in plants, but beta-carotene is still a less usable form of vitamin A than is found in animal products. Vitamin A plays a vital role in healthy vision, cellular division and differentiation, immune function, bone growth and fertility--just 1/2 cup of raw broccoli contains 20 percent of the recommended daily allowance, or RDA, of Vitamin A.
Vitamin B9, also known as folate, folacin and folic acid, is a water-soluble B-complex vitamin essential to healthy fetal growth. If pregnant women don't consume enough vitamin B9, fetuses are at risk for catastrophic birth defects, including anencephaly, a condition where a large portion of the brain doesn't develop. Fetuses with the condition are either stillborn or die shortly after death. Vitamin B9 also helps red blood cell formation, protein metabolism and cell growth and division. 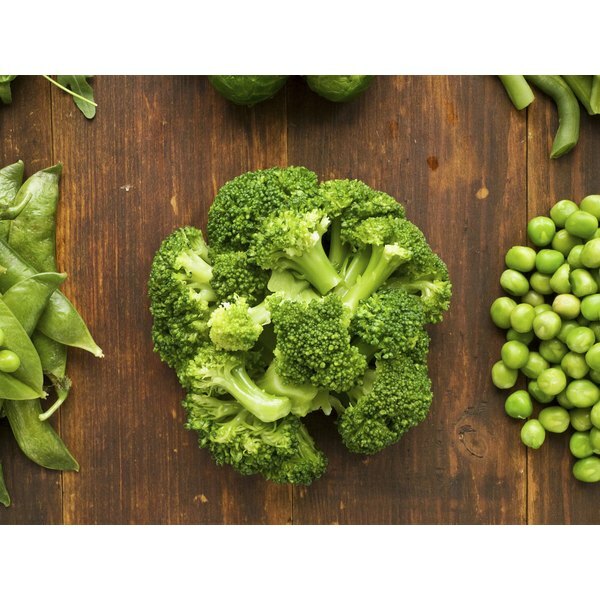 You can get 10 percent of your RDA of vitamin B9 from just 1/2 cup of cooked broccoli. Vitamin C is a water-soluble antioxidant that helps protect the body from cellular damage caused by free radicals, according to the National Institutes of Health Office of Dietary Supplements. Vitamin C is also integral to the production of collagen, the absorption of iron and healthy immune function. Eating 1/2 cup of raw broccoli supplies 60 percent of the RDA of vitamin C.
Because the human body is able to synthesize vitamin K, there is usually less nutritional emphasis put on it than on other vitamins, but it is essential to bone and tissue health and normal blood clotting. There is no set RDA for vitamin K, but green vegetables, including broccoli, and dark berries are rich sources of the vitamin.